Click on cover for larger view. Grab yer saris and and tie yer turbans, saddle pals, because Hawgleg is heading out east... the Far East, that is! Yup, them boys done got a serious case of curry fever for their newly released game: "Cowboys & Indians." Of course, this ain't yer grandpappy's game, pardners. Nosiree! For this game the Hawgleg boys are drawing on the splendor and mystery of Bombay and Tombstone to bring a little spice to a gaming table near you. And there will be spice aplenty in this modern reworking of the classic genre. "Look, we all love Apaches and Comanches as much as the next gamer," said game co-creator Mike Murphy via satellite phone from his palace in New Delhi. "It's just that we feel that particular genre had been done to death in that particular, traditional way. With this game we feel the need to bring something new to market, and this fits the bill. We think of it as Tex-Mex/Hindi fusion." The game will center on a single "Cowboys & Indians" core rule book which will contain all the material needed to run classic Western adventures in a meticulously researched – and plausible – alternate history, created by noted historian Mike Murphy in conjunction with his long-time associate and collaborator, Gore Vidal. In this alternate history, Arizona secedes from the union and quickly forms an international alliance with Brazil and Canada. The newly formed ABC confederacy joins forces with the UK to reassert its authority in the Far East, notably India, where it fuses the Code of the West with Land of the East. In short order, the Indians go from worshiping cows to wrangling them on cattle drives. "It's amazing how you can change one or two little details in a timeline and come up with a completely believable alternate reality," Murphy said. Murphy's partners agreed that the clarity of the alternate world is one of the major "hooks" for the game. "That and the rules for Bollywood-style dance numbers," added game co-creator Mike Mitchell. "I think the ability to mix skirmish-style gaming with lavish production numbers will definitely help this game fly off the shelves. I mean, what other game has a 'random tap dancing moves' table?" The seed of the game came into being last year while the Hawgleg boys were on their annual pilgrimage abroad. Banned from Hong Kong due to a misunderstanding in customs ("Never get back in line for body cavity searches," Mitchell said. "They really don't like that. "), the trio found themselves in India just in time for the Bollywood premier of the hit movie, "Slumdog Millionaire." Neither Murphy nor partner Paul Mauer were familiar with the Bollywood culture, but both were soon swept up in the grandeur of the scene. After the premier, the trio met with director Danny Boyle at the palace of Sultan Grabanob and enjoyed the hospitality of his Harem Scarum. "There's a reason it's called the 'Harem Scarum,'" Paul said. "I waited outside in the taxi and made arrangements for bail money. Just in case." The two Mikes enjoyed sipping the sweet nectar of their host's hospitality as they hatched a plan to bring their experiences to fruition in a new game that would take what they knew best (the Wild West of swarthy men in leather chaps with itchy trigger fingers) with what they were quickly coming to love (the sultry nights of the sultan's palace). The result of their efforts is a daring skirmish/battalion level game that provides rules for running classic Western adventures in the Far East: "Cowboys & Indians." While Murphy was getting down and dirty researching the alternate history with Gore Vidal, Mitchell was working with Vidal Sassoon – the famed hair stylist – to flesh out other important details in the game. "I felt it was very important for me to take matters firmly in hand with Vidal and ensure that we get the hair right. I mean, movement tables and weapon damage are all good and well, but in a game where cowboys battle while engaged in Bollywood movie style action, I felt it was important to focus on details like the affects of hair styles on movement, concealment, and cover," Mitchell said. "We worked long and hard into the night, but in the end, I think it call came together in the end." In addition to the groundbreaking hair rules, the game will feature a unique 2d7 mechanism for resolving skirmish vs. battalion-level combat… set to Indian dance music. "One thing we wanted to be very careful about in this game was to be respectful to our source cultures. 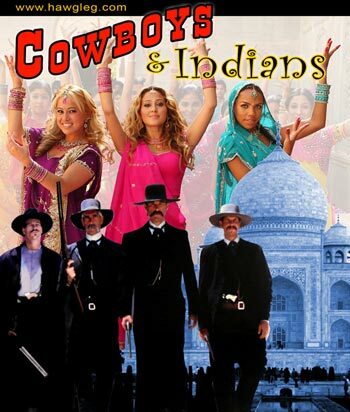 One thing we definitely didn't want to do was to create characters who were unflattering parodies of Indians. We definitely didn't want to do any sort of 'My name is Apu Nahasapeemapetilon, welcome to the Kwik-E-Mart,'" Murphy said doing a spot-on impression of the popular character from The Simpsons. Mitchell agreed with his partner of almost 20 years, adding that they planned to keep things classy, even as they planned modules like "Harold and Kumar escape from a Calcutta Prison." "Of course," Paul added. "That depends on whether or not we can clear the licensing issues with the Harold and Kumar people." Barring that, or other complications, the "Cowboys & Indians" core rule book will run 829 pages in full color for a cost of $4. Costs will be kept down by using monkey labor and printing the books on paper made exclusively from old-growth forests in Kurdistan. A line of lead-based miniature, using the company's 44.27 mm scale will ship concurrently with the book, just as soon as the Hawgleg boys get back from their trip time traveling to 1938 so they can buy up copies of Action Comics #1 and use the money to finance their shenanigans. In other words, folks, this is just another April Fool's Day story! Hope you enjoy it, and please don't blame any of the typos or insanity on Paul. Mitchell stayed up too late writing this for Paulie to proof it before morning. Have a great day, ya'll!